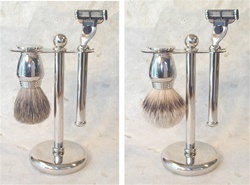 Nickel finish three piece set with pure "greys" or "silver tip" badger bristle brush. Comes with solid metal brush, holder and choice of Mach3® (pictured with set) or Trac II® cartridge blade razor (shown in picture 2). Complement this set with a lather bowl or mug. A shaving brush creates lather by using a shaving soap or cream and is warm to the skin as it raises the hair for shaving. In addition, it gently massages the face and improves skin circulation. It is kind, cleansing and mildly exfoliating yet gentle enough for sensitive skin. Check out our Reference Desk for more information.